When we find a great storage and organization tip - we share it with you! "Getting organized" is a popular New Year resolution. What's more important than your family photos? They capture so many special moments and tell the story of your family. This article from The Everygirl highlights a new product from Kodak - The Digitizing Box. What a great product! 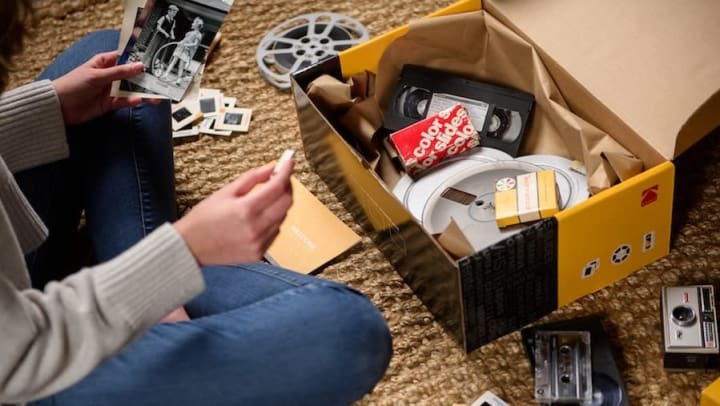 Order your box, fill it with your VHS tapes, films, audio recordings, and photos (they accept up to 19 different types of media), and they return your original items, plus digitized copies on a thumb drive, digital download or DVD. This makes it super easy to share with your family. Once you have your digital copies, what do you do with all of those photo albums and VHS tapes? We suggest you store those in plastic bins in your storage unit. It's important to make sure that there is no dampness or humidity inside your bin. You may want to consider a climate controlled storage unit for these treasures. We encourage you to read the full article from the Everygirl, as they explain in more detail the Kodak Digitizing Box and offer great tips on how to keep your digital files organized. It's definitely an inspiring project for the start of 2019! We'll continue to share helpful tips like this with you on the San Diego Self Storage blog. Stay tuned!